IT was nearly twelve years ago — a complete Jupiter cycle — that I was surprised to receive a letter postmarked Darjeeling, India. It was written by Marcia Moore who was then being permeated with India's lore and wisdom. During the intervening years, I visited several times at her former home in Concord, Massachusetts, and we had long talks on astrology and other topics of common interest. The precedent-making thesis on astrology she wrote for her degree at Radcliffe College showed already how lucidly she could present her subject in the context of psycho-sociological studies. This present volume is one that every serious astrologer and student should warmly welcome, for it comes at a crucial time in the development of Western astrology. In this century of changes and upheavals, such a book fills a genuine need. Today, astrology is claiming the attention of an increasing number of people. This expansion has largely been caused by the great interest which a growing number of young people are taking in the subject. More and more of these young men and women are college students or graduates, and even their professors are no longer as scornful of astrology as they used to be. However, the field of astrology is in a very confusing condition, for there are several distinct tendencies or schools of thought. Moreover, the manner in which astrology is presented to interested readers in the great majority of cases fails to satisfy not only the rational or fastidious thinker, but also a great many of the youth who hope rather confusedly to find "in the stars" a revelation of psychological, mystical, or "cosmic" truths, which they feel might give them a new and expanded sense of security and of attunement to the rhythms of the universe. At the beginning of the 1930's, Paul Clancy decided that the popularization of astrology was to be his life task. When his magazine American Astrology became a huge success in 1934, a new epoch began in astrology. Although Evangeline Adams and a few other pioneer astrologers in the United States had earlier laid the foundations for what is now known as "sun-sign astrology," the interested public was very small. It was the success of Clancy's venture that caused daily or weekly astrological columns, with readings for the twelve signs, to appear in the newspapers and periodicals of the United States and Europe. A number of astrological magazines were started, and though some went into eclipse, others have flourished ever since. I find myself in a peculiar situation with regard to this tidal sweep of modern astrology. Just at the time Paul Clancy started American Astrology, I became deeply interested in the psychology of Carl Jung. I had studied astrology in 1920 at Krotona, Hollywood, then the headquarters of the Theosophical Society, and in 1930 I met Marc Jones, who sent me some of his mimeographed material on astrology. During the summer of 1933, it occurred to me that a serious approach to astrology, such as he was beginning to present, could and should be correlated with depth psychology (especially of the Jungian type), for actually they complemented each other. Later that same year, I finally met Paul Clancy in New York. He had already printed some lectures I had given in Boston in 1930-31, and he gave me carte blanche to write anything along these lines for publication in his magazine. At that time, Clancy was eager to combine "popular astrology" with the type of "psychological astrology" I was beginning to expound. For several years, Grant Lewi wrote most of the "forecasts" and I many of the remaining pages of the magazine. In Europe, astrology had traditionally been a predictive art, used in the courts of kings and by statesmen and generals. The common people found astrology embedded in their calendars and in their customs concerning the growth of crops and the breeding of livestock. What is less well known is that great philosopher/mystics such as Paracelsus and Jakob Boehme wrote about planets, stars, astrological temperaments, etc., at a highly psychological and esoteric level. In this they were continuing the tradition carried on by the medieval alchemists and the occultists of many lands. There have always been two basic approaches to astrology, with many gradations of thinking in between. One, the predictive approach, concentrates on events and is most typically represented by Horary Astrology, which gives definite answers to equally definite and limited questions. The philosophical-psychological approach, on the other hand, concentrates on persons, with the understanding that the term "person" can be extended to social groups and collective entities displaying definite attributes of personality. For this second approach, especially when it deals with individuals, I have suggested the label of "Humanistic Astrology." Humanistic Astrology is conceived essentially as a language using the cyclic motions of celestial bodies as symbols which can convey to human beings a direct and pragmatically applicable understanding of the basic patterns of the bio-psychic processes which are the foundation of individual and collective existence. Such an understanding can help individuals to evaluate the meaning of their experience in terms of the total pattern of their life, seen as a consistent whole, structured from birth to death by innate tendencies. Thanks to such an understanding, seemingly fortuitous events and crises can be seen as phases and perhaps turning-points in the continuous flow of experience. Thus, they acquire a new meaning, and the individual can feel himself more at peace with the universe as a participant in the vast evolution of humanity, of the Earth-as-a-whole, and ultimately of the cosmos. While the scope of Humanistic Astrology extends from the field of depth-psychology to that of "peak experiences" and mysticism, its essential purpose is to inspire a greater understanding of the many factors and processes in an individual life, and to provide guidance in times of crisis and decision making. Such an approach to astrology is "holistic" in that it deals with the whole person, and with the birth chart as a whole, rather than with isolated planets or aspects labeled "good" or "bad." It refers any single happening, phase of growth, or period of crisis, to the entire life-cycle from birth to death. At times, it may even be able to suggest what conditions in the past were responsible for present difficulties, just as a pharmacist may infer from a doctor's prescription the nature of the illness which the medicine is intended to cure. Today, a number of young people, influenced by their college education and the general scientific mentality of the times, feel a strong urge to "prove" the validity of astrology through the use of contemporary techniques, especially statistics. French and Swiss astrologers started this approach between the two World Wars; and in England and the United States such efforts have recently been mushrooming. Their hope is to see astrology taught in the universities. This strictly scientific approach is perfectly legitimate. It satisfies the analytical mind and may lead to many valuable conclusions, provided it is intelligently applied and does not violate the inherent characteristics of astrology. There are, however, many pitfalls in such an approach. Since it is analytical rather than holistic, it deals with events rather than with whole persons. It singles out specific illnesses or specific careers as entities in themselves. This in turn implies a dualistic, either-or, yes-or-no approach which is the very opposite of the holistic viewpoint. Then there are the many practitioners of astrology whose methods are quite close to fortune-telling. Some who are psychically gifted may prove accurate in their predictions, and in a period when people are beset with uncertainty and insecurity, the demand for this kind of service is great. Whether or not the results are constructive depends on both the astrologer and the client. If I have commented at such length about the astrological situation as a whole in modern society, it is because I wanted to clarify the position taken in this book by Marcia Moore and Mark Douglas. It is an eclectic, open, and sound position. By temperament and training they lean toward the humanistic point of view with its spiritual overtones. 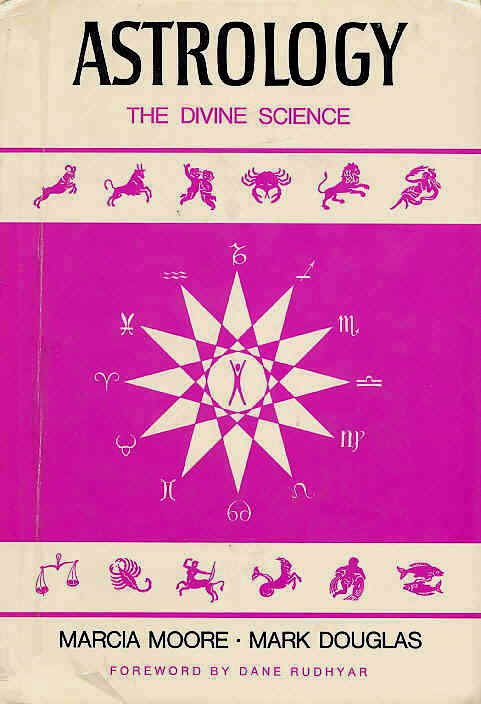 In an inclusive, lucid, and often original manner, this monumental book covers the entire field of astrology as it is generally presented in the West. The more complex and abstruse astrological systems and techniques which could have been discussed are generally omitted, for they would be significant only to the specialist. This book, like the others written by these two authors, is essentially for anyone who desires to be well-informed on the subject being treated. There is no necessity for the reader to have a background of technical knowledge. Astrology, The Divine Science gives an unbiased presentation which covers a vast amount of material in a wholesome, significant, and dignified manner. It should not antagonize anyone who is open-minded and aware of all the problems and confusing debates which characterize the field of astrology today. No fantastic claims are made. The discussions of the various positions of the planets, of interplanetary aspects, progressions, transits, and so on, are clear and definite. The book is not only inclusive in scope but is extremely well written. Beginners and established astrologers can both profit greatly from its discussion of the basic factors in astrology and from its many original and thought-provoking insights.